This is a completely different world, far from the noise of worldly vanity, the silence and serenity is everywhere. 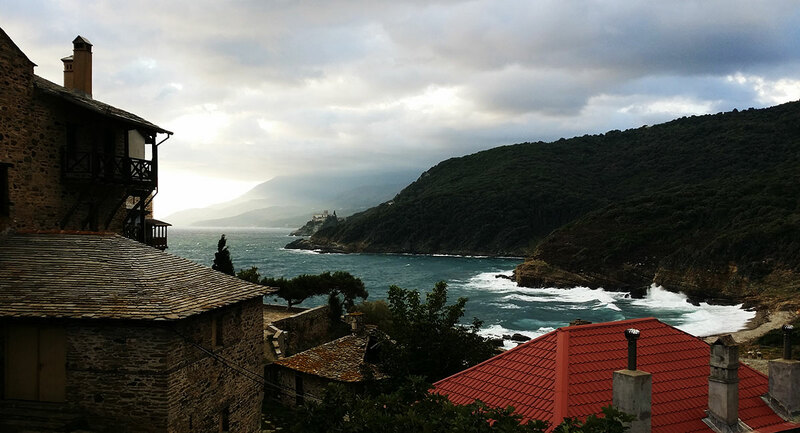 Under the clear blue of Greece, in favorable climate, among evergreen nature, there is a small peninsula – the famous Mount Athos – secluded. With approach to its transcendental heights, the heart is filled with joy and tremulous anticipation of meeting with the Holy Mountain, chosen by the Mother of God, inhabited exclusively by Orthodox monks, where you can contemplate only the dwellings of monks and God’s temples. HOLY MOUNTAIN AFON – “The Garden of the Blessed Virgin” – one of the sacred places not only of Greece and the Balkan Peninsula, but of the whole world. The Holy Mountain is living monument of Byzantine culture, a peninsula of prayers and hopes for the salvation of the World. 20 beautiful monasteries, the only monuments of world heritage in their kind – the dedication of the Most Holy Theotokos. The monks – the inhabitants of the Holy Mountain, and now more than a thousand, made a huge contribution to the development of world philosophy, theology, culture and literature, painting, architecture and applied art. 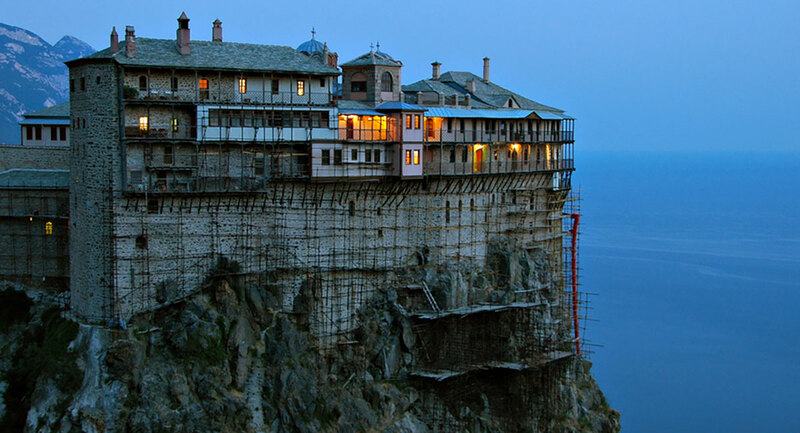 A typical Athos monastery is a complex of structures, either completely enclosed by a wall, or erected at the highest place for protection against vandals. Large structures adjoin the wall, in which are placed monastic cells, storerooms and workshops, refectory, treasury, library and chapels. The catolicon (the main temple, cathedral) stands separately in the center of the monastery courtyard, symbolizing the Ark of Salvation. When the time comes for service, one of the brothers goes around the temple, rhythmically striking the simantron – a long wooden carved board. Monasteries are divided into idiorhythmic and cenobetics. Life in the idiorhythmic is not severely restricted, honored elders rule the monastery, but a smaller brethren is constantly in the works. 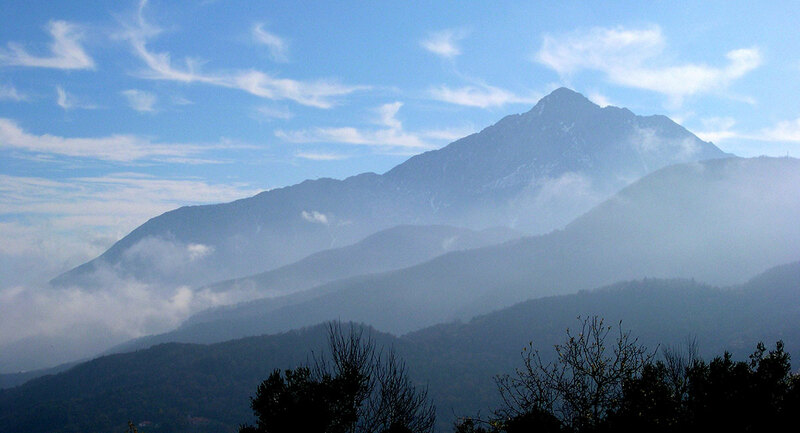 Idiorhythmic monasteries stand on the bottom scale of monastic ascension to the sky. A little higher can be put a cell life. Which is divided into the hermit and the ordinary. 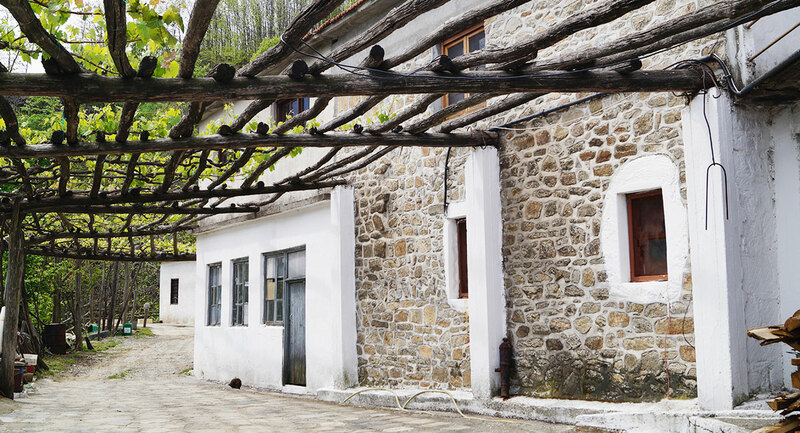 Cell Athos, located outside the monastery – is a whole house with all the accessories, the church and the household. If the cell does not have a church and a household, it is called kaliva and refers to the third stage of the Athon’s ascetic life. Kalyva’s way of being could be set higher in the ascetic way of being, but since they are not subordinate to anyone and live here on their own and for them first of all is a freedom, this makes their life difficult and suffering. An example of the high, amazing life of the Kalyva’s monks is the Monk Maxim Kavsokalavrit. Cenobetics monasteries – the most faithful royal way to heaven and in them – a real reflection of the life of the Apostolic times. The greatest of the Fathers considered that the life of the Kalyva’s monks is to too high and not bearable by all people. Despite the fact that the monasteries were repeatedly exposed to fires and raids by marauders – Arab pirates, Catholic francs, Catalan mercenaries, heretical iconoclasts – as a result of which monastery treasures and manuscripts were lost, many things were still preserved. For the sake of interest, it should be noted that in Russia in 1917, with a population of 90 million people, there were 1.025 functioning monasteries. In Greece today, with a population of 10 million, there are 1000 monasteries, and this after 500 years of Ottoman oppression, after the devastating Italian and German occupation, during the Second World War, after the bloody civil war almost destroyed the country. Of special interest to the pilgrim are relics and other shrines, including the particles of the Life-Giving Cross of the Lord, the belt of the Blessed Virgin, the honest head of St. Panteleimon, the relics of the righteous Anna and the particles of gifts broughted by the magi to the Child Christ. There are 17 Greek monasteries from 20 monasteries active today: the Great Lavra, Vatopedi, Iver, Dionysiat, Kotlomush, Pantokrator, Xiropotam, Dokhiyar, Karakal, Filofei, Simeopet, St. Paul, Stavronikita, Xenophon, Costamonite, Russian – St. Panteleimon Monastery, Hilandar and Bulgarian – Zograf. Holy Mount Athos is under the jurisdiction of the Patriarch of Constantinople and is the oldest republic in the world, existing as such continuously. The official language here is Greek.